Welcome to the home page of the Herbarium! This site serves as a gateway to the services and resources provided by the Herbarium. It was developed to serve the needs of a diverse clientele - from agents to students to professional taxonomists. Browsing through the cascading menus above, you will find information on our plant identification service, online plant ID resources, catalogues and databases, and more. Our collections databased to date can be accessed through the SERNEC portal. 2. To transfer the taxonomic expertise developed to various users that depend on the generated knowledge. Documenting and understanding plant diversity is a necessary prerequisite to assessing the conservation status of plant species and a precondition to meeting the GSPC goal of conserving 60% of the world’s threatened species in situ (Target 7 of the GSPC), as well as the N.C. Cooperative Extension Service's (CES) strategic priority to protect the environment and natural resources. We are active in understanding and documenting plant diversity both locally and internationally. Our efforts to transfer taxonomic expertise gained through our studies--via floras, online plant identification resources, online specimen catalogues, and plant identification services--should also contribute to easing the “taxonomic impediment” to the sound management of biodiversity that has been identified by governments through the Convention on Biological Diversity. Transferring taxonomic expertise also contributes to the CES strategic priority “to strengthen the economy, through profitable, sustainable, and safe food, forest, and green industry systems.” Accurate plant identifications are vital extension contributions as they can (1) prevent livestock loss through poisoning by identifying target plants for removal from pastures, (2) prevent time and financial resources being wasted on pursuing ineffective weed control measures, (3) facilitate the identification of plant diseases of potentially economic impact, (4) aid physicians in taking appropriate measures upon physical ingestion of plant parts by patients, (5) aid state agencies (such as the S.B.I. and the NC Wildlife Commission) in cases involving plant products. The Herbarium is maintained by the Department of Plant and Microbial Biology with funding from the North Carolina Cooperative Extension Service and the North Carolina Agricultural Research Service. Committed to research, teaching, and extension service, the herbarium is used locally by faculty and students, as well as by visiting scientists. In addition, through an active specimen loan program, NCSC serves monographic and floristic research at similar institutions around the world. Comprising about 125,000 specimens, NCSC is the third largest and second oldest of North Carolinas three major collections. A brief history can be found here. 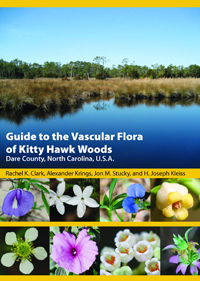 We are pleased to announce the publication of the Guide to the vascular flora of Kitty Hawk Woods (Dare County, North Carolina, U.S.A.). 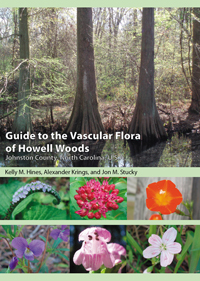 The volume represents the second in the Illustrated Floras of North Carolina series from the North Carolina State University Vascular Plant Herbarium (NCSC) and the Botanical Research Institute of Texas Press.